The weather here in Houston isn’t exactly what most people picture as “perfect fall weather,” but that doesn’t mean we shouldn’t prepare our patios and outdoor spaces for when the heat does finally decide to die down. Nothing makes a patio cozier than some wool blankets, comfy outdoor furniture and some mood-setting exterior lights. In this blog post, we’ll go over five tips for making your patio cozy for the upcoming fall weather. At M&M Lighting, we offer high-quality interior and exterior lighting products for your home or office. If you’re in need of some new outdoor patio lights for a renovation or simply want to spruce things up before fall hits, we have light fixtures that can match both your style and budget. With more than 50 years of experience under our belts, our lighting experts can connect you with your ideal outdoor lighting solutions. Contact us today to schedule an appointment. 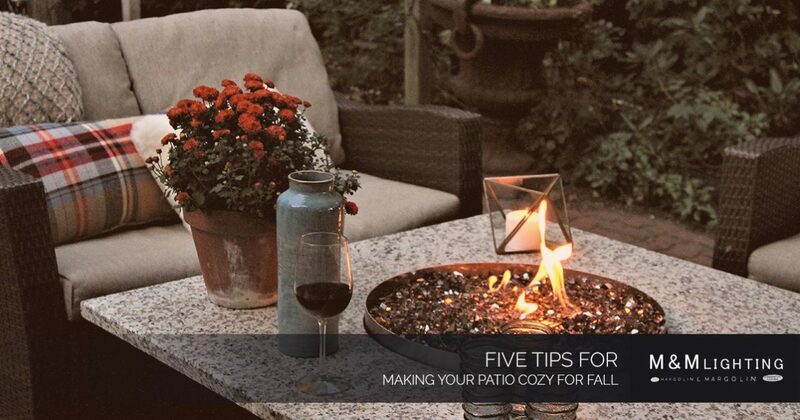 Here are our five tips for making your patio warm and snug for the changing of the seasons. 1. Optimize Your Exterior Lighting Situation. Our evenings are getting darker earlier than they were in the summer, which means our exterior lighting situations are more important than they were during the warmer months. Your outdoor lighting should be functional and beautiful, but it should also be adjustable so you can utilize your patio for several occasions. You can use this time to update any necessary outdoor lights, such as your exterior wall lights or perhaps any hanging lights that have seen better days. You can also use this time to purchase additional lights to complement your existing ones, such as holiday-themed string lights or an installation of an elegant outdoor chandelier. Overall, illuminate your patio with exterior lighting that warms your outdoor space on the chillier nights. 2. Add Items That Exude Coziness. OK, be honest with us — what sounds better than breathing in the fresh outdoor air while snuggling up under a warm blanket with your favorite book? That’s right. Nothing. Why spend your time indoors now when you know that’s where you’ll be hibernating during the winter months? Take advantage of the not-yet-freezing weather while you still can! You can do this by adding cozy, comfortable items to your outdoor patio that just exude coziness. You can also add bold autumn colors, such as deep reds, yellows and oranges, to these items or choose them in these specific colors to really add a next-level impact of coziness. 3. Introduce Outdoor Cushioning Options. In order to spruce up your patio or outdoor space, you can easily add some outdoor cushioning to your existing outdoor furniture. This can be as simple of a task as adding plush, weather-proof pillows to your benches or as complex as purchasing an entirely new set of furniture. Some folks like to swap out their summer-themed outdoor furniture with pieces that are more useful and relevant during fall. Large, heat-insulating cushions are more practical in October than they are during July, don’t you think? No matter how small or large the change, we highly recommend adding cushioning to any outdoor furniture you can. 4. Get Into A Holiday-Decorating Mood. There are two major holidays that happen to fall during the fall time: Halloween and Thanksgiving. These are two holidays where people love to decorate their homes! When you’re pulling out your favorite autumn leaf dishcloths or Halloween-themed salt and pepper shakers, don’t forget to give your outdoor spaces some holiday love, too. You can opt for traditional Jack-O-Lanterns on your porch, or you can buy a turkey-themed garland to hang criss-cross above your patio. You can also get creative and make DIY signs with words that highlight the season (i.e. “thankful,” “harvest,” etc.) and take advantage of the brief period where the leaves on our trees and bushes change. Either way, we suggest you utilize this time to get into the holiday spirit and to let your outdoor spaces reflect that enthusiasm! 5. Install An Outdoor Fireplace Or Fire Pit. If you don’t already have one, and if your home’s outdoor space has the room for it, we recommend installing an outdoor fireplace or fire pit. Fires are a great source of natural exterior lighting, and nothing screams fall more than sitting around a fire chatting and spending time with your loved ones. This is also another source of warmth for the nights that require more than just heavy outdoor attire and blankets, and a fireplace or fire pit makes for an excellent focal point in regards to exterior design. When you transform your patio and outdoor spaces for fall, you create a welcoming and comforting atmosphere that will make you and your guests want to snuggle up outside around a warm fire with some hot chocolate. And really — what else is this pre-winter weather all about? Get exterior lighting and outdoor home accents at our lighting showroom in Houston. If you’re not sure where to start, don’t be afraid to ask our trained and experienced lighting consultants for assistance! For additional information about the brands and products we offer, contact us today. You can reach us by calling (713) 469-3002 or completing our online form. Also, don’t hesitate to stop by our Houston lighting store at any point. We look forward to speaking with you!